August 19, 2016 by Ken Ward Jr. This week, I’m going to try to get back into the habit of doing a post every Friday that tries to provide a quick look at a few coal-related news stories from around the Internet that I found interesting. Here in the heart of central Appalachian coal country, an economic experiment is underway inside an airy renovated Coca-Cola bottling plant. Most days, Michael Harrison, a former mine electrician and “buggy man” who once drove trucks 700 feet underground, can be found hunched over a silver laptop, designing websites for clients like the Pikeville tourism board. I guess it’s a decent enough story, as far as it goes. And it’s certainly good to see many of the grassroots people who are working hard on these issues portrayed for the huge audience that will see a big Times feature like this. 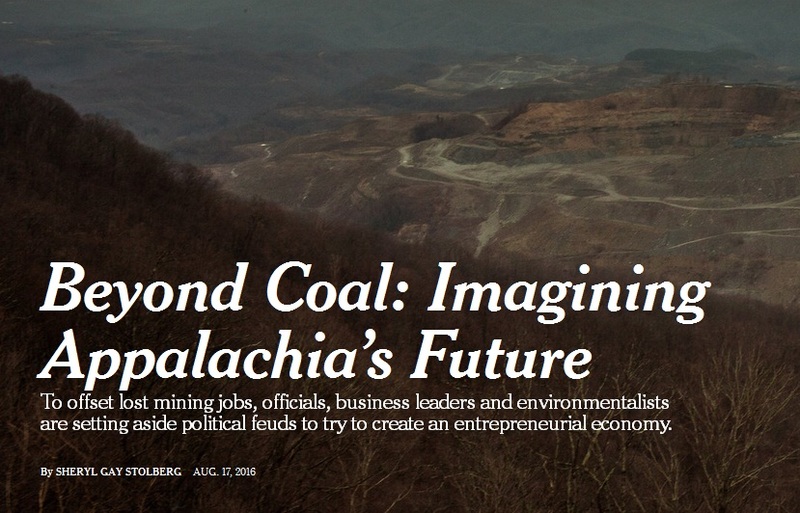 Giving the Times a break, I’m not even going to go into the fact that the story doesn’t bother to point out the other factors — besides environmental regulations — that are killing the Appalachian coal industry. 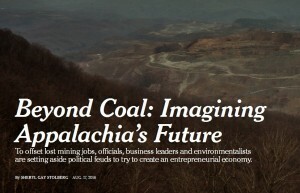 But I couldn’t help thinking that one thing that the story desperately needed to point out was that the Obama administration — which the story went to pains to note is constantly criticized in the region — is trying hard to help these grassroots people get to work diversifying the Appalachian coalfield economy. 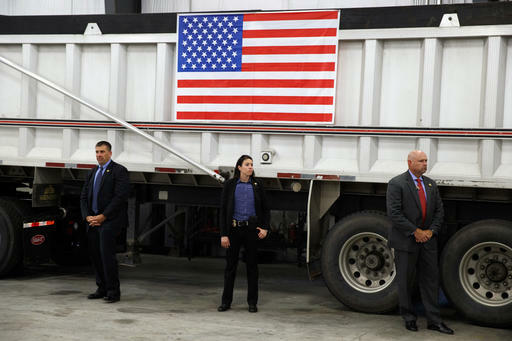 Even more importantly, this story absolutely needed to make note — given the political situation it chose to include very high up in the narrative — that there is bipartisan support for the major pieces of President Obama’s plan that would protect coal miner pensions and increase spending on abandoned mine cleanups, two areas of legacy liabilities that must be addressed for the region to move forward. And if you’re wondering why the story focused more on Kentucky, don’t forget that statewide political leaders there made diversifying the coalfield economy a major issue, with the SOAR initiative. Here in West Virginia, Sen. Jeff Kessler tried to get a similar program moving. But Gov. Earl Ray Tomblin was slow to step up, and his main project is trying to find some way to make use of the mountaintop removal-ravaged Hobet site along the Boone-Lincoln county line — an effort that faces huge challenges that were clear from the start and have been made more clear by Andy Brown’s reporting for the Gazette-Mail (see here and here). 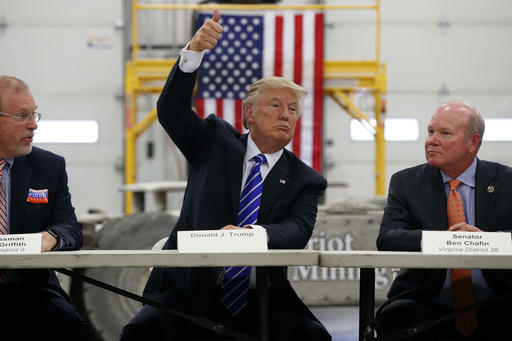 Donald Trump promised “to bring the coal industry back 100 percent.” Hillary Clinton was forced to walk back a remark about putting it “out of business.” But a new study by the Federal Reserve Bank of Cleveland finds laid-off coal miners are beginning to bow to the inevitable and train for jobs in other industries. It appears to be working. As of March 2016, the HOME program has enrolled more than 3,000 laid-off coal miners and their spouses. Of those enrolled, 1,449 have received support while training for new careers. More than 1,100 have obtained new employment, while 90 participated in internships through the HOME program. Feedback from employers who are hiring workers who have been through the HOME program has been positive, too; EKCEP staff have heard “universally rave reviews about coal industry workers. What surprised Mr. Zimmerman, the deputy policy director at the Center for Western Priorities, a conservation advocacy organization based in Denver, was that the coal industry was, at least in this presentation, deliberately drawing a comparison between itself and the tobacco companies. That is more typically the argument of environmentalists, who often compare fossil fuel companies to the tobacco industry. They note that the tobacco giants for many years funded trumped-up science and advocacy groups to spread doubt about risks of smoking. Fossil fuel companies, they argue, have engaged in similar efforts, and investigations by state attorneys general have focused on the tactics of Exxon Mobil, which has funded groups that deny the scientific evidence that human activity has increased global warming. Fossil fuel companies and their allies generally ridicule the comparison to tobacco. Others have taken note of it as well. After reviewing the presentation, shared with him by a reporter, the state attorney general leading the investigation of Exxon Mobil, Eric T. Schneiderman of New York, called it important. “This is just the latest example of the fossil fuel industry explicitly adopting the Big Tobacco playbook,” he said. A leading U.S. coal regulator announced plans on Tuesday to toughen what it called “out-of-date” rules for guaranteeing mine cleanups. The Office of Surface Mining and Reclamation Enforcement said it would start working with U.S. state regulators to modify rules on self-bonding, a decades-old program that allowed healthy coal companies to post promissory notes instead of collateral to guarantee returning disturbed land to its natural setting. Critics have said current self-bonding rules are harmful because they leave taxpayers exposed to billions of dollars of environmental liabilities if a coal producer fails to comply with its legal obligation to clean up pits. Three of the four largest U.S. coal companies, including global leader Peabody Energy Corp, have filed for bankruptcy in the past year with more than $2 billion in self-bonds for future mine cleanups across several states. Replacing at least some self-bonds has been a key element of bankrupt coal companies’ restructuring plans. Currently, West Virginia is not allowing additional companies to self-bond. The only company that currently has any self-bonded reclamation obligations in the state is Alpha Natural Resources. The DEP informed Alpha in July 2015 that it would no longer accept any additional assurance under the self-bonding instrument and instructed the company to begin transitioning to an acceptable form of bond. Two months later, the agency formally ordered the replacement of Alpha’s self-bonds and has since entered into a consent agreement with the company that provides a timeframe for that to occur. Finally, two stories about China. Climate change is a wickedly complex problem. But if you had to isolate one factor as the key, the linchpin upon which any credible global solution must turn, it is this: coal in China. Coal use has exploded in China over the last 30 years, especially the last 15. For any chance of success in avoiding the worst effects of climate change, the country must reverse that trend — peak and then rapidly reduce coal use, hitting zero as soon as practically possible, preferably some time around 2035 to 2050. For that reason, China’s relationship to coal is a subject of great fascination and debate. A provocative contribution to that debate was published in the journal Nature Geoscience recently: “China’s Post-Coal Growth,” by Ye Qi and Tong Wu of Beijing’s Tsinghua University and Nicholas Stern and Fergus Green of London’s Grantham Research Institute. Deep in the coal heartlands of northern Shanxi province, people in Helin village are fighting a losing battle as the ground beneath them crumbles: patching up cracks, rebuilding walls and filling in sinkholes caused by decades of coal mining. Around 100 pits in Helin – buried in the hilly rural outskirts of the city of Xiaoyi – have been exhausted, and cluttered hamlets totter precariously on the brittle slopes of mines. But while local authorities have begun evacuating hundreds of thousands of residents most at risk elsewhere in Shanxi province, Helin’s situation – though serious – isn’t yet considered a priority. Mines that burrowed under villages and towns during China’s three-decade coal boom have left the authorities with the need to evacuate hundreds of communities in danger of sinking. Shanxi province alone plans to move 655,000 residents by the end of next year from unsafe old mining regions, with the cost of relocation estimated at 15.8 billion yuan ($2.37 billion). The Shanxi government estimates coal mining has cost the province 77 billion yuan in “environmental economic losses”. Thanks Ken for the Friday roundup. I recently read that China is rapidly moving away from coal, laying off a million miners in unsafe mines, shutting down pollution belching power plants so the Chinese can breath, etc. Thank goodness our industries that dig and burn coal have been regulated. Even as our regulations get tighter, coal is being replaced here primarily because we developed cheaper alternatives. Although China’s powers that be are now moving to clean up their environment, it is only after their problems became much too great to keep ignoring. I prefer our economic/political system, and our freedoms to express ourselves and to find a better way, to China’s dictatorial system which tends to lurch in one direction then another. I also appreciate the roundup. The always-extensive comments section in the NYTimes articles are (to me) thoughtful and diverse, and I think the NYT does a good job of picking a few to highlight. Your readers might want to check them out. Happy to see the return of the “Friday roundup”. Keep up the good work. I too appreciate the Friday roundup, but in my forty plus years in the industry I have never seen three of the top four U.S. coal companies go bankrupt in one year. How could they all be so wrong about the market and their own reserves? Also, Lew could you reference the article you quote about China moving away from coal and laying off millions? Thanks. Steve, what about the idea that multiple and serial bankruptcies are not so much a surprise but one part of a multifaceted industry-wide long term business plan to shed and extinguish “legacy” liabilities as coal investors deal with the climate crisis and its overwhelming consequences. I don’t have the expertise to assess the merits of this view but it seems to explain what we have been seeing. So Tom, you think it may be conspiracy on the coal companies part to all go bankrupt at the same time. No blame on anyone or anything else. All blame and lies at the feet of the evil coal companies. The all powerful arm twisting, mind bending fat cats that not only took advantage of poor mountain folk but also Wall Street Investors and also blindsided the union. And let’s not forget those gullible state politicians. And they all worked together, as one unit. I just don’t know about all this Tom? Steve, apparently I was not clear, and for that I apologize. I’m not a business expert, but like you I notice that bankruptcy seems to be much more part of the part of the “tool kit” of coal companies than for most businesses. It’s not a conspiracy, and bankruptcy is legal, but if Wall Street people want to do well they must necessarily be drawn to strategies that allow them to shed their liabilities, just as consumers who are over their heads can do in bankruptcy. I’m not assigning blame but frankly I have little sympathy for investors who have reaped plenty of profit and now won’t help pay the costs that we all have to otherwise eat. You asked a good question and I hope others may offer some answers.